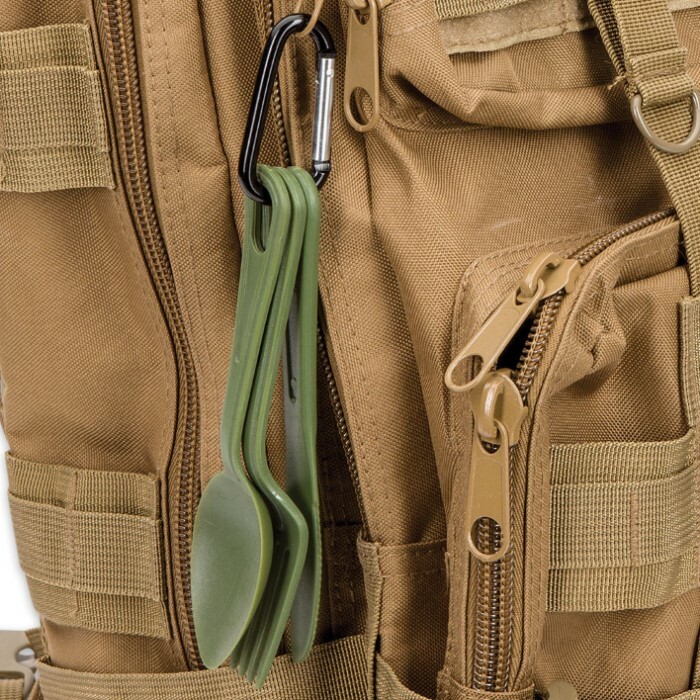 Trailblazer 3-Piece Lexan Outdoor Dining Utensil Set on Carabiner - Army Green | BUDK.com - Knives & Swords At The Lowest Prices! If your mother came along on one of your outdoor adventures, she'd likely chide, "Roughing it in the woods is no excuse to forget your table manners!" Thankfully, it's easy to keep Mama happy with this handy utensil set from Trailblazer. 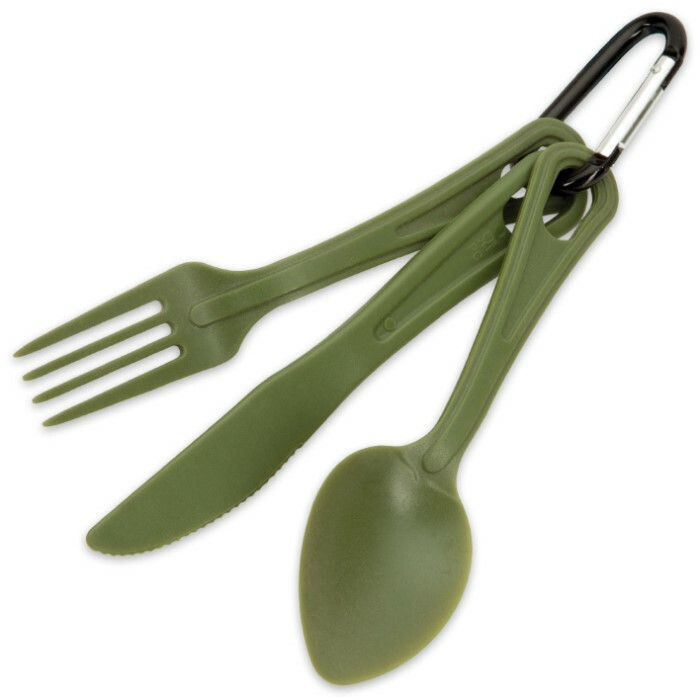 It includes an army green fork, spoon and knife, all made with tough, corrosion proof Lexan. They're easy to keep and store together on the included 2" carabiner; clip the set securely to a belt loop, backpack or anywhere else that provides easy access to this all-important camping accessory. And Mama's right - eating with filthy hands while outdoors can lead to fun-ruining and even life-threatening illness via the spread of bacteria and other pathogens. Using the fork, spoon and knife in this versatile set may prevent these types of food-borne ailments, all while making outdoor dining easier and more enjoyable. At 6" long, each utensil is comfortably sized for vigorously chowing down, yet takes up very little precious space in your gear. The set is also extraordinarily lightweight. 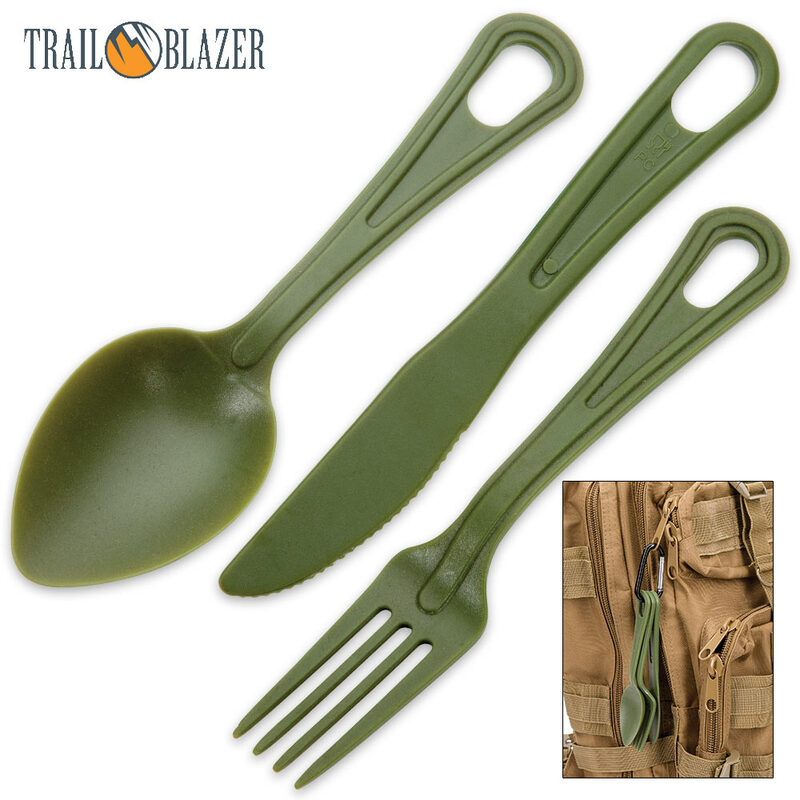 With all these great features, the Trailblazer 3-Piece Dining Utensil Set is no mere luxury - it's a must-have for any serious camper, outdoorsman, prepper, survivalist or anyone who dines outdoors! Got them during BOGO sale, good deal.